Crescent Lake is approximately 30 square miles of clean, sparkling water, lush shoreline vegetation, and excellent scenery. It is over 11 miles long from North to south and from 1 to 3 miles wide from east to west. It is bordered to the east by Flagler County and the west by Putnam County. The lake is fed to the south by Haw Creek. 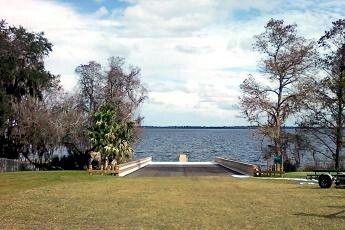 To the north, the lake connects to the St. Johns River through Dunns Creek. Bear Island is a private island located near the center of the lake. Crescent City offers food, drink and lake access. The Trail begins to the south at Haw Creek and ends at Dunns Creek State Park’s Pine Landing. Crescent Lake is known for its American Bald Eagle population and largemouth bass, speckled perch and blue gill fishing. It is a prime American Alligator habitat. Manatees are known to make this lake home. Cypress swamps border most of the shoreline. 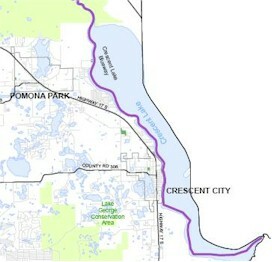 Towns along the trail include Crescent City and Pomona Park. There are two public landings in Crescent City and several private landings. Crescent City has two parks on the shores of the lake – Fletcher Park and Margary Neil Nelson Sunrise Park. A short walk from the lake is the Lake Stella landing and park. There is public land at the end of Pomona Park Landing road but it needs development. Flagler County manages the Haw Creek Preserve and Russell Landing. There are two other public landings on the east bank in Flagler County – Bull Creek Campground on Dead Lake and Shell Bluff landing just off Highway 100 south of San Mateo. Because of the size of Crescent Lake, it is recommended that paddlers keep to the beautiful shorelines. There lake averages 10 feet in depth and caution should be used when crossing the lake. This is a well-known bass fishing lake and fast boats are always present. Wind can be an issue so checking the weather is as essential as it is in any outdoor activity in Florida. A list of landings with GPS coordinates will be available on the county’s website and in brochures.